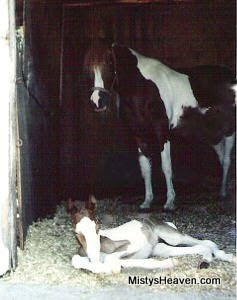 Virga was Misty II's fourth foal. She was named posthumously by Celina Boltinghouse. The filly was born with very badly contracted tendons. She was unable to stand on her own to nurse so she was bottle fed for a time, but unfortunately the filly did not live very long.